What are the clubs doing on the yacht? 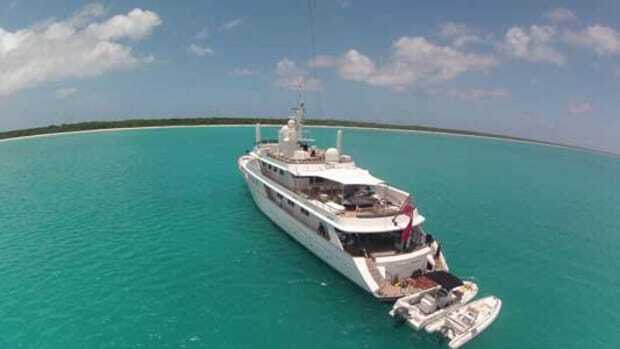 For a few active yachtsmen, the vessels they own or charter are perfect vehicles to cruise to links in tropical settings or use as platforms to practice their swing. A few months ago, I found myself on one of the Caribbean’s great golf courses, the Teeth of the Dog at Casa de Campo on the Dominican Republic’s southeast coast. The fairways were tight, with nary a brown splotch anywhere, and the greens were fast and true. Overall, I found this impressive course to be in better condition than many prime US courses. On the fifth hole, one of several along the water, I met a couple who had cruised here on their yacht to play the resort’s three Pete Dye-designed courses. Their boat, moored in the resort’s large marina, was the perfect golfers’ chariot, a means of transportation with top-notch amenities, including Jacuzzis, Jet Skis, sumptuous meals and evening theater. It struck me as a great way to unite two disparate passions into a single sybaritic enterprise. Golf and yachting are not normally mentioned in the same breath. But let’s say you love the game and you want to turn your yacht into the ultimate golf cart, what are the options available out there? If you’re cruising the eastern seaboard, New England, or even the Canadian coast, you’re in luck. There are so many courses there that you can play a new one every day and hardly have to move the yacht. Occasionally, you even find a combination of both. 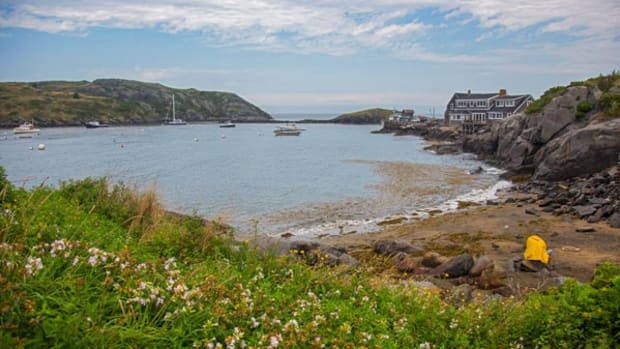 The Fox Harb’r Resort on Nova Scotia’s coast, for instance, has a first-rate golf course and a 161&apos; Trinity tri-deck motoryacht that is available to golfers who want to play a variety of other courses located within a few hours’ cruise. 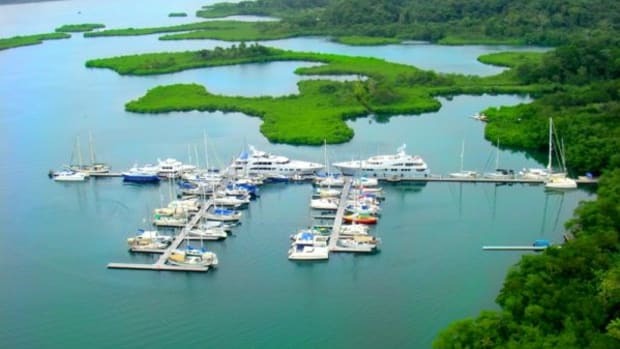 The yacht Destination Fox Harb’r Too, which splits its charter schedule between Canada and the Caribbean, has become a very effective marketing tool for this high-end resort. Although charter brokers uniformly say that few clients wish to play a round or two of golf during a cruise, it does happen. 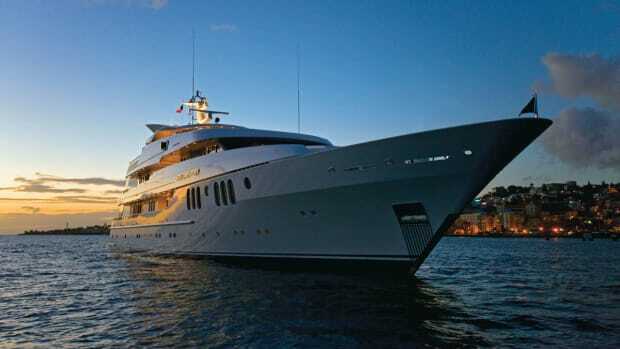 For avid linksmen gunkholing for two weeks from New York to Palm Beach, playing a new course every day and finishing each round with a muscle-relaxing hop into the hot tub followed by a five-star meal prepared by the yacht’s Le Cordon Bleu-trained chef, this can be the ultimate vacation. There are many more golf courses in North America than there are in the Caribbean, and until the past decade or so the tough sea environments yielded more brown fairways than greens. 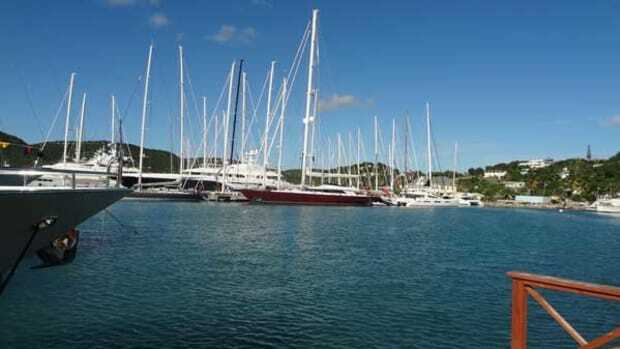 Historically, Caribbean golf has not been a huge draw, especially for the yachting crowd. But it is changing. Botanical advances in golf turfs—especially the advent of a grass called Paspalum, which thrives in the salty air—have enabled Caribbean courses to compete with top US courses. The problem, of course, is getting to them. How about using the yacht? Some of the region’s best golf courses are in the Dominican Republic, where award-winning courses (including the aforementioned Teeth of the Dog course, with a hellish 75.9 rating) and a full-service megayacht marina are located. Golfweek magazine recently selected the Jack Nicklaus-designed Punta Espada course at Cap Cana as the best in the region. Perhaps because Casa de Campo is an overnight haul from the Virgin Islands, charter boats with golfer guests often choose the Anguilla, Nevis and St. Thomas area for golf instead. 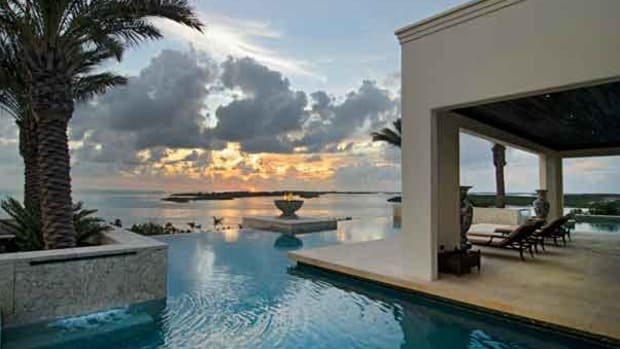 The charter yacht Sweet Escape’s first choice is Anguilla, which boasts the difficult 7,063-yard Greg Norman-designed Temenos Golf Course. 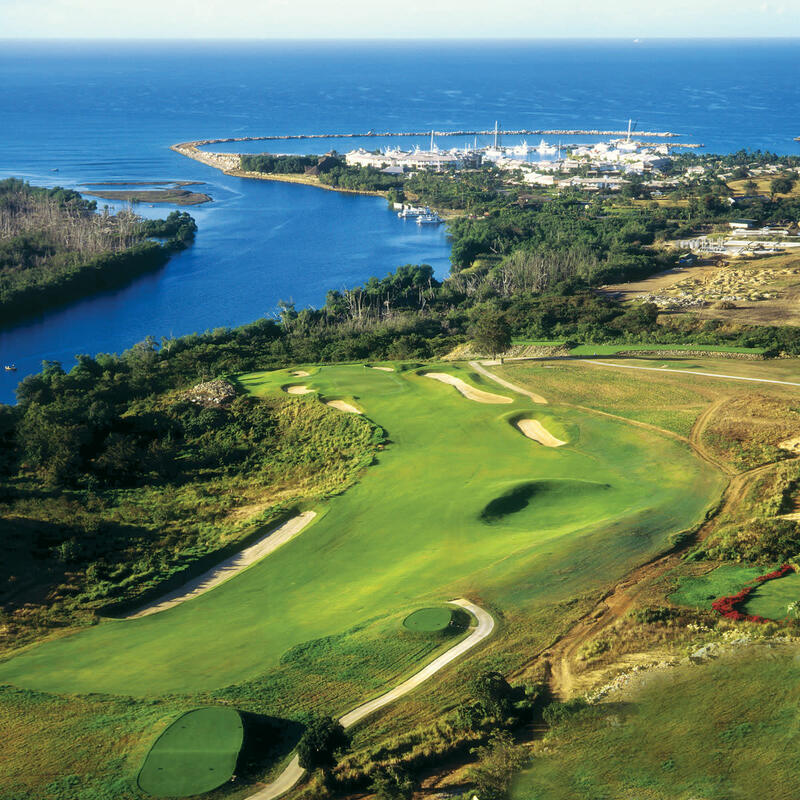 Nearby Nevis and St. Kitts each have a single golf course. The Marriott hotel chain operates the Royal St. Kitts Golf Club, renovated in 2004, and allows golfers to play two holes on the Caribbean Sea and three more on the island’s Atlantic side. On Nevis, the Four Seasons Resort operates a Robert Trent Jones II-designed course, 6,766 yards with a 73.6 rating and a slope of 132. 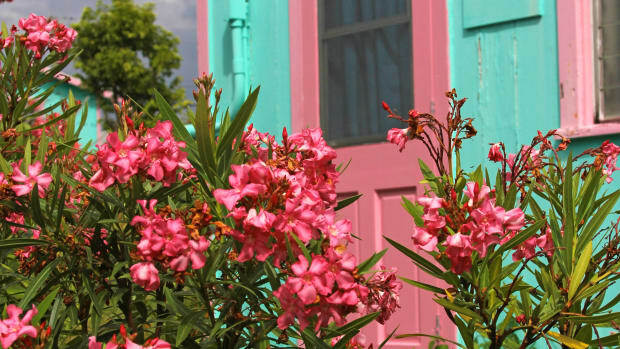 If you’re cruising a little closer to the equator, however, Barbados and St. Vincent and the Grenadines offer some great options. Barbados, especially, has several courses open to itinerant yachtsmen. The Sandy Lane resort has two Tom Fazio courses. The Country Club course reached worldwide notoriety in 2010 when a local golfer got into the Guinness Book of World Records with a 12-hour round that produced a record 54 birdies in a single day. 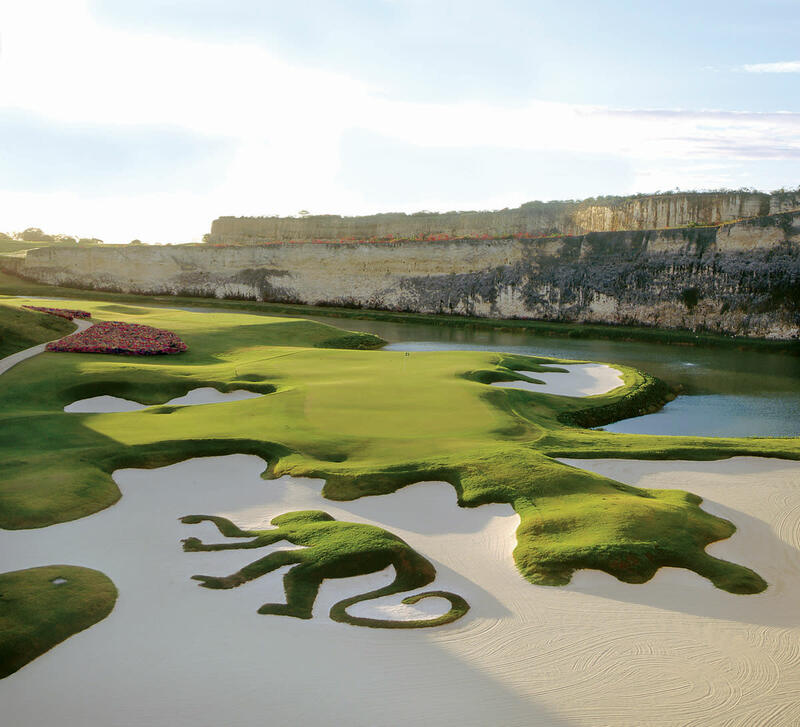 The other, a 7,343-yard course set in an old limestone quarry, The Green Monkey, is reserved to club members and guests of the Sandy Lane. 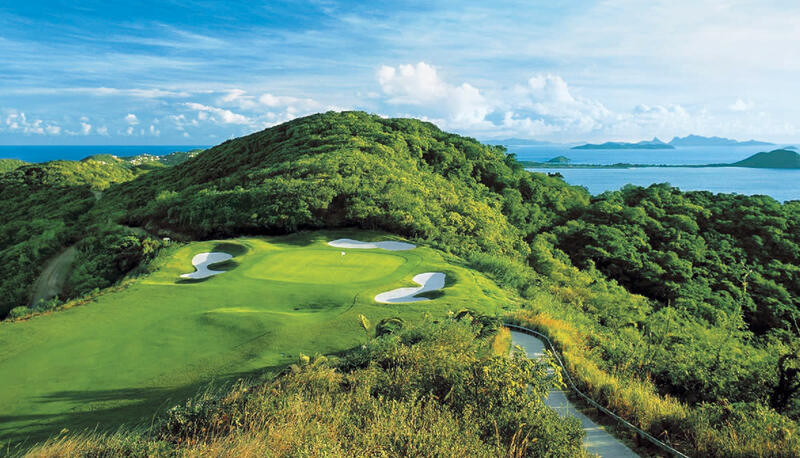 But perhaps the Caribbean’s most dramatic and interesting course is a Jim Fazio creation in Canouan Island in the Grenadines operated by Trump International. This scenic but very tough 6,900-yard course has a rating of 76.5 and a slope of 147 from the back tees. The 16˚ hole plays as a 304-yard par three (making it one of the world’s longest par threes) and a 240-foot drop from tee to green. If you have altitude sickness, don’t go there. Still, you don’t have to be a pro to enjoy a game. A few enterprising yachts, including Sweet Escape, a 1993 Christensen, have turned the sport into an onboard afternoon frolic for the whole family. All it takes is clearing the boat deck of all the toys, removing the stanchions and installing a plastic pad of fake turf as a tee box. A crewmember riding a Jet Ski can hold a net as a target and later retrieve all stray floating balls. Players can alternate between the Jacuzzi, the bar and the tee box. For occasions when it may be difficult to retrieve floating balls, players can use biodegradable balls, which are able to go a hundred yards and break down, ending up as fish food after they hit the water. “It’s another thing to do for people to enjoy their vacation,” says Aaron Clark, captain of the 144&apos; Palmer Johnson motoryacht Four Wishes. Hitting balls for a couple of hours is an activity that both golfers and non-golfers can enjoy. 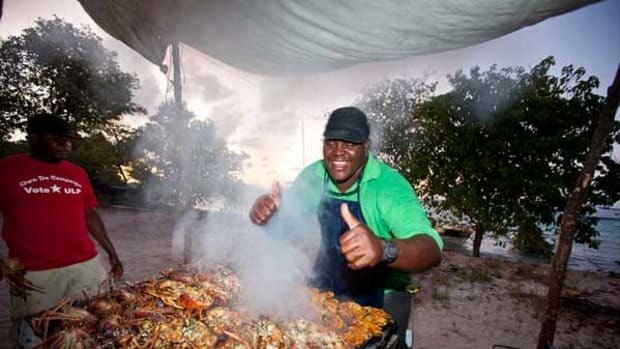 Who's Afraid of the Abacos?